Wisteria trees are not actually trees. Wisteria is a biological member of the Fabaceae family, which includes peas. Grafting and staking the stalks of the plant allow it to grow tall and look like a tree. 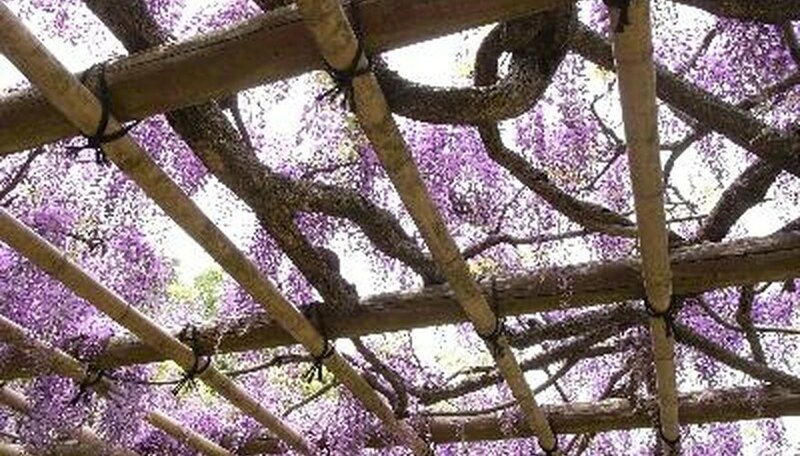 Wisteria is extremely hardy and a vigorous grower that over time displays twisted trunks that give the plants a stately look. Chinese wisteria can grow to 25 feet in height with blossoms that grow from 6 inches to 1 foot in length. Chinese flowers can be violet blue or white, as with Wisteria sinensis (Alba), which is the most fragrant of all. The Black Dragon cultivar produces dark purple flowers and double blossoms. The Plena produces traditional lilac-colored flowers. Japanese wisteria come in a broader range of colors than Chinese wisteria. For example, the Carnea is light pink, while the Rubra is deep pink to red, and the Longisimma is light purple. The Violacea Plena bears double, red-violet-colored flowers. Japanese wisteria's flower clusters can grow as long as 18 inches, and trees can reach heights of 25 feet. The Macrobotrys is an exceptional grower, with clusters that can grow to lengths of 3 feet or more with vivid red-violet flowers. Choose a site that gets at least six hours of sun each day. While wisteria is not known for being fussy about soil types, it’s always wise to conduct a soil test before planting. Strive to achieve a pH level of 6.0 to 7.0 for best results. Use peat moss, compost or manure to strike a proper pH reading. Soil amendments will help provide the tree with proper aeration and drainage, which can prevent the wisteria from becoming waterlogged. Dig a hole that is at least 18 inches in width and at least 8 to 10 inches deeper than the root ball. Water the hole, add the plant and backfill it with soil, making sure there are no air pockets, and press down on the soil firmly. Create a 2- to 3-inch layer of mulch on the topsoil. New trees should be grafted and staked. This allows the tree to establish itself in the soil and build a strong root system. Use simple wood stakes for grafting and support. As the tree develops, you can broaden the support system by building a grafting support with wood lattice panels. The flowers of mature trees can be grafted to create an arbor for a patio or garden area. The flowers on wisteria trees usually open in the early weeks of May. The flowers usually open at the same time, providing a magnificent and showy display. Pruning is an important care requirement for wisteria, as they can be quite invasive and aggressive growers. Prune during the early summer by cutting side shoots that grow less than 6 inches from the soil. Repeat pruning in the fall by leaving only two to four bud shoots on the stems. Continually check for bud shoots that grow at the base of the plant and remove them immediately. This practice is especially important for overwintering care and controlling growth, as wisteria are famous for developing underground shoots as long as 10 to 50 feet.